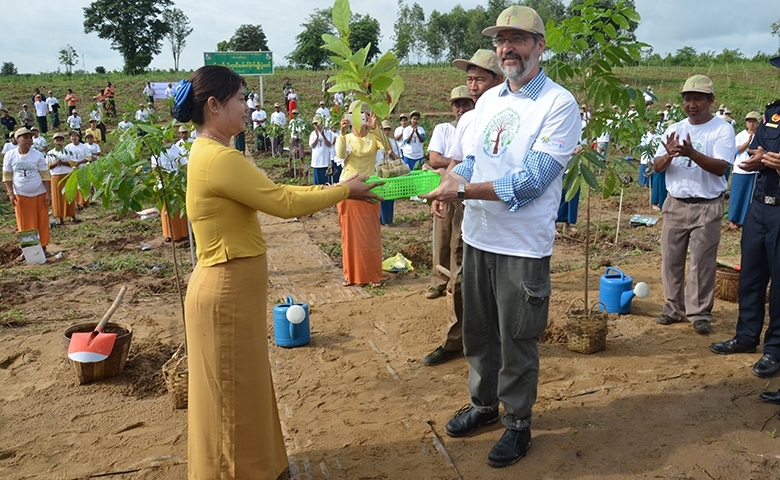 As part of the National Greening Campaign 2016 in Myanmar, a tree planting event was held on 16 July in Kyauktaga township of Bago Division. The event, which took place alongside the Yangon-Mandalay express highway, about 140km north of Yagon, was jointly organized by the Forest Department of the Ministry of Natural Resources and Environmental Conservation (MONREC) and the UN-REDD Programme in Myanmar, in collaboration with administrative and government departments, Civil Society Organizations, international NGOs and villagers. Attending the event were Bago Region Parliament’s Chairman U Khin Maung Yin, as well as the Deputy Chairman, Administrative Department staff of Bago Region, the Region Minister for MONREC, Bago Region Director, Forest Department staff, and UN-REDD programme staff. Also present were Kyauktaga township’s administrative department staff, members of political parties and Civil Society Organizations, and about 700 villagers of five villages in Kyauktaga township. Some 3600 seedlings were planted during the event. Species used included Teak (Tectona grandis), Iron Wood (Xylia dolabriformis), Japanese Padauk (Galphimia gracilis), Padauk (Pterocarpus macrocarpus), Tamalan (Dalbergia oliveri), Mahogany (Swietenia macrophylla), Yemane (Gmelina arborea), Thinwinn (Millettia pendula) and Nathani (Pterocarpus santalinus). The National Greening Campaign 2016 has seen large areas of land planted with trees. In Bago Region alone, over 1.2 million of seedlings have been planted with the participation of the general public, Civil Society Organizations, international NGOs and various government departments on weekends during the monsoon season. Preparation for implementation of REDD+ in Myanmar is guided by the Myanmar REDD+ Readiness Roadmap, which is being implemented by the Forest Department of MONREC supported by international organizations like the Korea Forest Service, International Tropical Timber Organization, Center for People and Forests, Asia Air Survey, International Centre for Integrated Mountain Development, Forestry and Forest Products Research Institute and the UN-REDD programme in Myanmar. For more information on the UN-REDD Programme in Myanmar, please also visit the country page of UN-REDD Programme website.